More than half of women over 40 in the U.S. have dense breasts, which affects how their breast tissue shows up on a mammogram. All women who undergo a mammogram could soon learn whether they have dense breasts, and how that impacts cancer detection and their cancer risk. The information would be part of the letter every woman gets after her breast cancer screening, the U.S. Food and Drug Administration proposed this week. Women in many parts of the country already receive this notification: 36 states have breast density reporting laws thanks to grassroots efforts by patients who felt blindsided because they weren’t told their mammograms could be more difficult to interpret. Having a national standard would help ensure every woman get the most accurate information she needs after a mammogram, said Lisa Lacasse, president of the American Cancer Society Cancer Action Network, in a statement. How will the change affect women and what does it mean if a patient has dense breasts? We asked Dr. Attai, an assistant clinical professor of surgery at the David Geffen School of Medicine at the University of California Los Angeles; and Dr. Dana Smetherman, chair of the American College of Radiology Breast Imaging Commission and section head of breast imaging at Ochsner Health System in New Orleans. What does it mean if a woman has dense breasts? It has to do with the proportion of fatty tissue, glandular tissue and fibrous connective tissue in the breast. The more fibro-glandular tissue a woman has, the denser the breast. Age is the biggest factor: Younger women naturally tend to have denser breast tissue. As estrogen levels drop with menopause, much of that glandular tissue gets replaced by fatty tissue. Thinner women often have dense breast tissue. For others, it’s hereditary or just how they’re born. More than half of women over 40 in the U.S. have dense breasts, which is a risk factor for developing breast cancer, the FDA noted. Having dense breasts is not something a person can see or feel — it’s different from having a lumpy breast, Attai said — rather, it’s determined by a mammogram. How do dense breasts affect mammogram readings? Dense tissue shows up as white on X-rays — think of how bones stand out in those images. Fatty tissue, on the other hand, looks gray on a mammogram, so a tumor stands out. Should women with dense breasts still have a mammogram? Absolutely, both experts emphasized. “That’s a very, very important message,” Smetherman noted. Women will still benefit from mammography, which is the only FDA-approved screening tool for breast cancer. 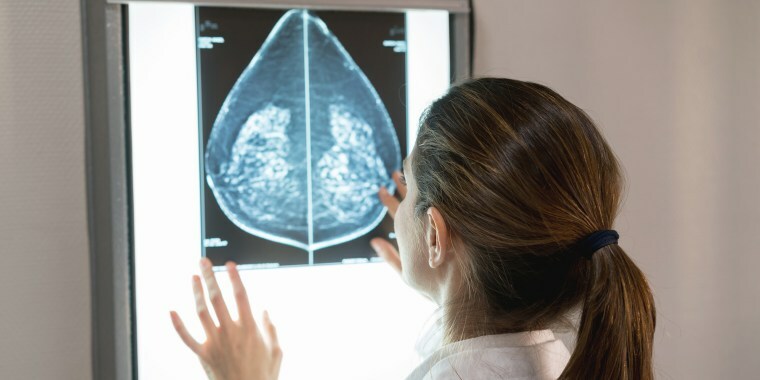 Mammograms are sometimes the only way to detect calcifications, which are associated with early stages of breast cancer in some cases, Attai said. What are the next steps for women with dense breasts? A 3D mammogram can improve the cancer detection rate and reduce the likelihood a woman gets called back for false alarms, Attai said. It’s not always covered by insurance. A breast ultrasound or a breast MRI can be helpful as supplemental screenings, but those tests are not automatically recommended. They may find more suspicious spots — which may lead to biopsies and other invasive procedures — but there hasn’t been much data to show they improve survival. “It’s one reason why we have to be very cautious before you say, ‘Yes, everybody with dense breasts should have this additional thing’,” Smetherman added. Right now, women who have dense breasts and who are considered to have a high lifetime risk of developing breast cancer — perhaps because of family history or other factors — get a routine annual MRI, Attai said. Does the FDA proposal mean insurance would cover the cost of additional screening for women with dense breasts? No, at least not yet. The proposed change would “enhance the communication of important clinical information” between patients, doctors and mammogram centers, but the FDA doesn’t regulate insurance coverage, said Megan McSeveney, a spokeswoman for the agency. When Attai recommends supplemental screening for women who have a high risk of developing breast cancer, she usually has no problems getting their insurance to cover those tests. For all other women, it’s all across the board. The FDA’s proposal could be a first step in changing that, she said.